We have lots of good news to report after the recent success of our Operation Squeaky Wheel in DC which was made possible by ALIPAC volunteers and donors like you! 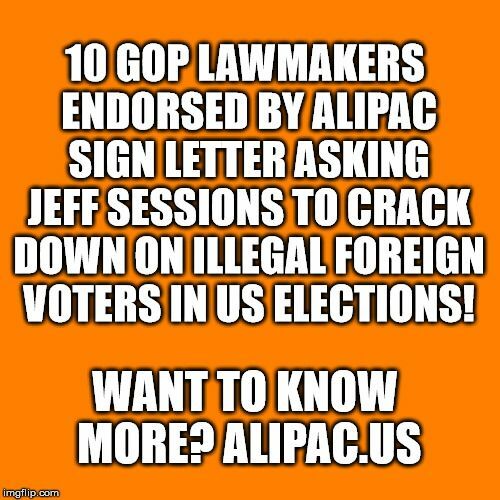 As you know, this has been a big focus of ALIPAC for many years, and our recent efforts to push for action in DC combined with our tracking list of non-citizen voter documentation (View) is making new ground! Washington, DC— Tuesday, Congressman Mo Brooks (AL-05), joined by 22 other Congressmen, sent a letter to U.S. Attorney General Jeff Sessions urging him to devote more resources to protect American election integrity from foreigners who illegally interfere in American elections by illegally voting in them. Last edited by ALIPAC; 10-09-2018 at 07:50 PM.